Tseveendorjin Oidov is a Mongolian poet, sculptor, and artist. A prolific writer with a career stretching over more than forty years, he was one of the founders of the Gal (Fire) group of writers and intellectuals in the 1970s who sought to balance traditional Mongolian culture with each individual’s artistic vision. He was asked to design a new Mongolian State Seal in the 1990s and is considered one of the country’s foremost authors. 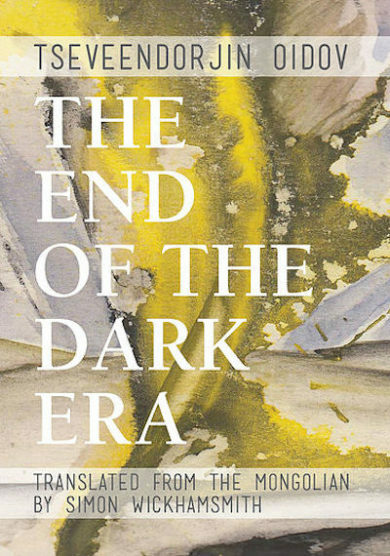 His collection of poems The End of the Dark Era was translated by Simon Wickhamsmith and published in 2016. Simon Wickhamsmith is an academic, musician, and translator of contemporary Mongolian literature. He teaches in the Asian Studies and Writing program at Rutgers University. He earned his PhD from the University of Washington, and has published translations of many works of contemporary Mongolian literature. Wickhamsmith was awarded a 2015 PEN/Heim Translation Fund Grant for his translation of poet Tseveendorjin Oidov’s The End of the Dark Era. Doors at 5:30. Event will begin promptly at 6:00 p.m.
Join us for a conversation with Mongolian translator Simon Wickhamsmith and Scott Esposito about Wickhamsmith’s translation of Tseveendorjin Oidov’s The End of the Dark Era. Wickhamsmith was awarded a PEN/Heim Translation grant for his work on the book, and he’ll talk about how he became interested in Mongolian literature and the challenges of translating from the language.